There is no pope for the United Methodist Church. So who speaks for the church? I do not nor does my bishop. The authority to speak for the church resides solely in the General Conference. That is it. There is no spokesperson for the church. There are General boards which have secretaries and can speak to their designated area but not for the church itself. The General Conference is an international body of nearly 1,000 delegates that meets every four years. The delegates are elected by annual conferences (at annual conference sessions) to attend General Conference. They represent all annual conferences around the world. Half of the delegates are laity (non-clergy members), half are clergy. Bishops attend the General Conference but cannot vote. Different bishops serve as presiding officers during the conference. Other bishops cannot speak unless permission is specifically granted by the delegates. 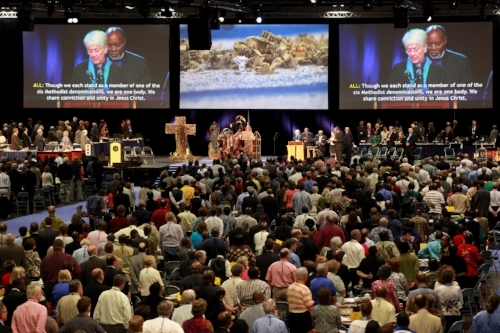 During General Conference, delegates discuss and vote on petitions and resolutions proposed by individuals, agencies, annual conferences, and other groups within the denomination. These actions result in a revision of the Book of Discipline, the denomination's book of law, and Book of Resolutions, policies of the denomination on current social issues. It is at General Conference where delegates wrestle with today's issues in light of scriptural teachings and the church's understanding of that teaching. Here is where the church's official stands and church policies are made regarding such issues as human sexuality, abortion, war and peace, as well as determination of ministries and funding. General Conferences are held in years divisible by 4, such as 2008, 2012, 2016, etc. Resolutions for General Conference must be submitted months ahead of time. The body of General Conference has the power to call a special meeting with a special, focussed agenda. This is a called General Conference. This is what happened in 2016. The Conference voted to have a called session in February 2019 to address resolutions concerning Human Sexuality and to have a plan for a way forward. General Conference is not a nimble, fast moving body. It moves slowly, sometimes excruciatingly slowly. Yet in its deliberations is a continuity back to the early church. The first church council takes place in the book of Acts. The first decision the early church makes is a bureaucratic one: who is going to replace Judas Iscariot? Even when it seems like it, bureaucracy is not antithetical to the Gospel. When people are together, decisions have to be made. Sometimes those are not the decisions you would make. Being a part of a church is holding on to the fact, by faith, that God is more present in our deliberations than the sinful humans are. Because ultimately, our hope does not rest in General Conference or the United Methodist Church but in our Lord, Jesus Christ, who called the curious community of people together to grow holy and follow him in faith, hope, and love.